The New York Times reports on the battle of Fort Davidson. Ewing’s “defeat” is both a tactical victory in terms of the relative casualty numbers, and a strategic victory, in that Price’s assault on St. Louis will never develop. St. LOUIS, MO., THURSDAY, OCT. 6th, 1864. The safe arrival at Rolla of Brig. Gen. EWING, with his command, is simply told, but when the circumstances of the campaign are detailed, and the mind dwells upon them for a space, a feeling of admiration for the skill and bravery of that Commander must find place in every breast, and cause a glow of patriotism to thrill the heart that truly feels for the brave men who are sacrificing so much to restore peace to the nation. My communication of the 2nd inst., gave you a general idea of the battle of Arcadia Valley, which events have proven to be the struggle for the possession of the Iron Mountain Railroad, and hence the temporary possession of St. Louis by the rebels. A few more details of that affair are necessary to complete the account, and these I am enabled to give from the highest and most reliable sources. came from PRICE, by the hands of a refugee, for EWING had persistently resisted every attempt of the rebels to gain on him by a flag of truce, a favorite dodge of theirs. The proposition was that if EWING would surrender his command, he would be permitted to march out of the fort, officers carrying their side arms, and private property of all held sacred from pillage. It is needless to say that this was disregarded, and the preparations for evacuation and retreat went on. At midnight these were completed and the garrison was withdrawn through a covered way, and the artillery removed by muffling the wheels and moving stealthily until the shadows of the mountain concealed all from view. The evacuation was a complete success, and the command moved rapidly out northward on the Caledonia road, as Gen. EWING hoped to reach Mineral Point, where he expected to find A.J. SMITH’s brigade, but instead of this, he encountered in the streets of Caledonia the advance of SHELBY and drove it back. This circumstance was proof positive that the upper part of the road was in the hands of the rebels. He had little time to determine on his course, for SHELBY was now coming in force from Potosi, so EWING decided to strike for Rolla by way of Webster and Osage. PRICE’s proposition was accompanied by a threat that if it was not agreed to, he would take the fort by assault and kill every man found in it. 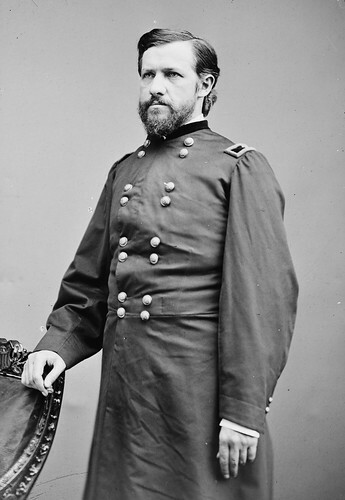 SHELBY was ordered from Potosi for the purpose of making the assault, and it became his apparent duty now to follow EWING and either capture or demolish his command. Wednesday night was very dark and stormy, succeeding a day of constant skirmishing with the enemy who seemed to spring from the ground on every side. The retreat was conducted under the most embarrassing circumstances, for a host of refugees, white and black, old men, women and children flocked to the Union banner and sought protection under its bright and friendly folds. At every attack and fire of the enemy they stampeded and imparted alarm to the raw soldiery, now no longer protected by earthworks, but exposed in the open field to an experienced and overwhelmingly superior foe. Nothing could have saved the entire force from utter demolition but the unflagging energy, coolness and courage of Gen. EWING and the battery of Rodman’s guns. This entry was posted in Missouri, Sterling Price, Thomas Ewing. Bookmark the permalink.